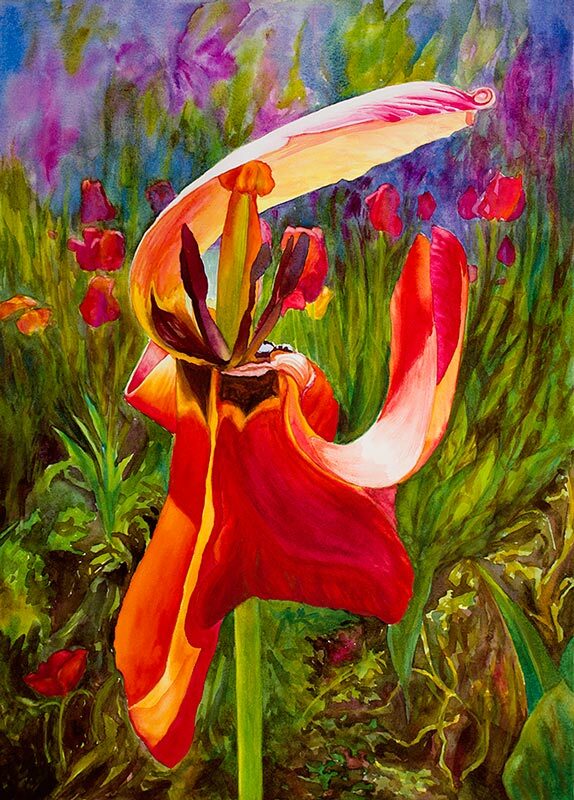 Big Tulip, Watercolor on paper, 30x22"
Big Tulip started with this journal sketch and photo which led to a craving to work big for a change. I jumped right in with a full sheet (22×30″) of watercolor paper, reminding myself that it’s not that different: just use bigger brushes, bigger puddles of paint, and bigger movements. Of course there’s more to it than that. In planning the painting I decided I’d be free and loose with the background, just go for it and see what happens rather than draw it in. It was fun, but there was a lot of background. I’d like to try the painting again, doing it a little differently. I’d draw the background plantings with more specificity and I would also use different pigments. I’ve been experimenting with using cadmiums for the yellows, orange and red instead of my usual transparent colors in my palette. The cadmiums are perfect for journal painting when I want to try to get a rich color down in one layer. They’re stable and easy to work with so they will remain in my travel palette. But when trying to work with juicy wet-into-wet washes, the cadmiums just sit there and don’t move, like stodgy, Wednesday night meatloaf. For painting close-up flowers I like the excitement and challenge of colors that charge into each other and zip around. It’s fun to paint a petal with lots of water and then drop in rich, bright colors, let them mingle, and try to get them to go where you want by tilting the painting. This flower is like Isadora Duncan, flinging her scarves! Gorgeous, Jana. Wonderful!!! I am amazed again at your just jumping in and doing it, a big (huge to me since I usually just work in a journal!) painting that turned out beautifully. Good hint about the cads. I don’t have any in my palette but may have to put some in…. You are very brave – full sheet paintings scare me to death. Beautiful tulip. Your approach to the background is very interesting and realistic . Nice painting! It’s a beautiful painting! And I think you for the info on the cadmiums. Maybe that is why I struggle with wet into wet techniques. Mine never seem to flow like I see others do! Such vibrancy in the colors! Absolutely fantastic — everything a watercolor painting is SUPPOSED to be!